If you’re hoping to get out in the sun with some of the best ocean scenery and clear turquoise waters that you can find on Anna Maria Island, there’s no better place than Manatee Public Beach. At 4000 Gulf Drive, Holmes Beach, FL this spacious public beach is centrally located on Anna Maria Island in the Holmes Beach community. It’s easy to access no matter where your Holmes Beach vacation rental or other island lodging is located, as the free island trolley stops directly there. On any given day, you’ll find large crowds of people and families relaxing and enjoying the sunshine, waves and perfect weather, relaxing with umbrellas and beach chairs, swimming, and making sand castles. Concessions and a café are located right on the beach so that families can conveniently purchase refreshments and drinks. You can easily spend all day here if you wish, but there are many other restaurants and stores to explore in the nearby Holmes Beach area. Just jump on the free trolley and visit them whenever you’re ready to head out! 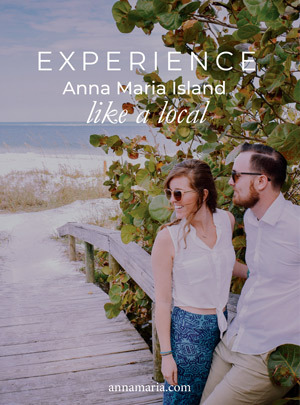 Located right on Manatee Public Beach, Anna Maria Island Beach Café is where you can start your outdoor adventure day, as it is open in the early morning at 7:30 a.m. This restaurant has some of the best breakfast that you’ll find on the island, with a menu that includes pancakes, French toast, eggs, omelets, corned beef, biscuits and gravy, and every other delicious breakfast food you can think of. Breakfast is served until 11:00 here a.m. There’s nothing like eating a homemade breakfast here in the sun on the beach, with a refreshing ocean breeze to get you ready for the day! You also won’t have to lug around beach furniture whenever you want to visit Manatee Public Beach. Rentals are available from the café for cabanas, umbrellas, and beach chairs at low daily rates. A small little bamboo beach bar is also located on Manatee Public Beach and it serves both non-alcoholic drinks, beer and frozen mixed drinks. Pick up a hard-carved monkey coconut cup while you’re there – a unique souvenir to take back home! With so many facilities, nearby concessions, volleyball courts and beach rentals, you can easily spend your whole day at Manatee Public Beach. Get your daily dose of vitamin D and watch the waves crash in, or swim in the pleasant, calm and warm waters with lifeguards watching vigilantly nearby. This large and spacious beach will easily accommodate you and your guests. Even on busy days you’ll still find a space to claim as your own. Arrive early in the morning for a beachside meal or head out in the late afternoon and view one of the most breathtaking ocean sunsets you can imagine! You’ll find all the beachside fun you could ever want at Manatee Public Beach. No matter where your Holmes Beach vacation rental is located, you’ll be able to get to it in no time.